Not a Planned Purchase, but irresistible: this rhinestone Eiffel Tower was just $5 at a Brooklyn thrift shop! While my Shopping Ban for 2013 got off to a great start, I wouldn’t say it ended very successfully. I seemed to fall off the wagon in summer, did better in early fall, then had many moments of weakness at the end of the year, especially with the December release of the L’Wren Scott Collection at Banana Republic. I will not be repeating this exercise for 2014! However, I’m glad I tried a Shopping Ban last year and I did learn some valuable lessons about my own spending and shopping habits, which I thought I’d share with you. 1. A little luxury goes a long way. I noticed if I let myself indulge in a little something it made it easier to look at online sales or things in a department store and think, Do I really need that? Is there something I already own that can take the place of buying that jacket/pair of jeans/pair of shoes/bag? And a good deal of the time I could think of something I already owned that precluded me from making a purchase. The polishes I bought in 2013. My little luxury very often turned out to be nail polishes. I bought seven of them last year. My current favorite is still Elusive by Revlon, but I’m already eyeing Essie’s Bachelorette Party (the hot pink in the center) and Lilacism as colors for late winter. 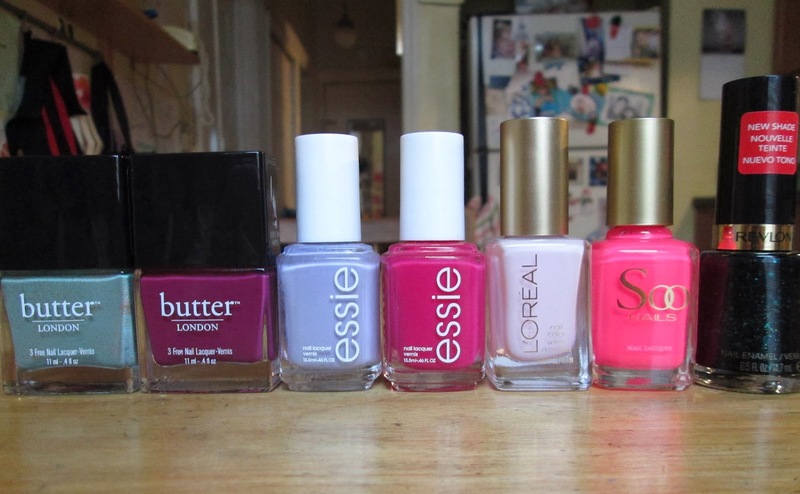 The most expensive was butter LONDON’s Queen Vic, at $15. Most of the rest were $6 or under. Not bad! 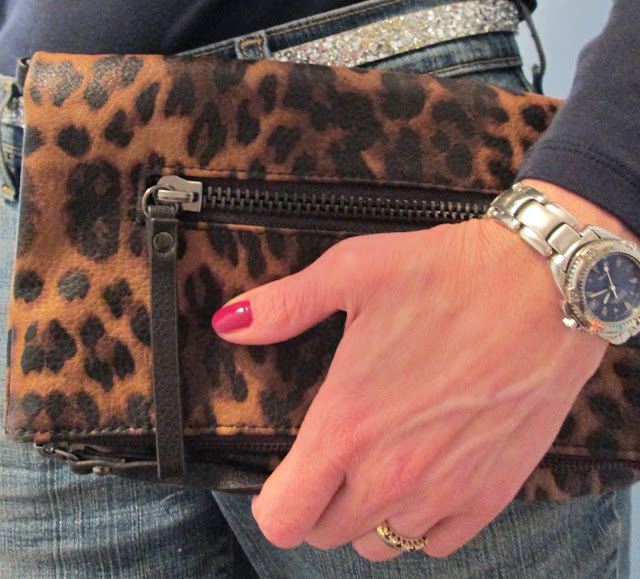 A leopard clutch I bought from Sheree of It’s Not That Deep. What a great buy: I use this all the time. 2. The “I Want It” list does work. The “I Want It” list, when I used it, really helped me to control my spending. If I saw something and just had to have it, on the list it went, where I thought about it for a month. Plenty of times I forgot what was on the list by time the month was over, which proved it would’ve been just an impulse buy. Of course, I will admit most of the nail polishes above were impulsive purchases, but there were times when I resisted the siren song of new colors! And sometimes buying a $5 nail polish kept me from buying something more expensive that it turns out I didn’t need. I couldn’t say no to this J. Crew crystal baguette necklace. 3. Shopping bans force you to think before you buy. The most important lesson I learned was that a ban can force you to think before you buy anything. Sometimes I’d steamroller right over my good intentions but I never forgot about the ban and that by saying yes to one item now I might have to say no to something else down the line in order to stick to my budget. Just knowing that proved to be very helpful at times when saying no was my best option. 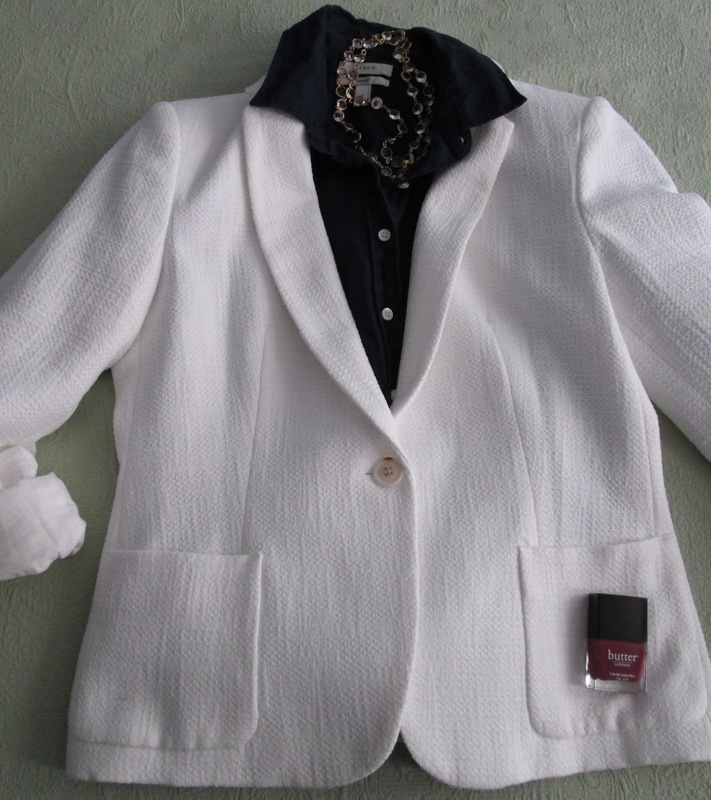 Even more temptation in this white blazer by Zara. In reviewing what I did buy in 2013, I’d say my one of my downfalls was wanting to take advantage of J. 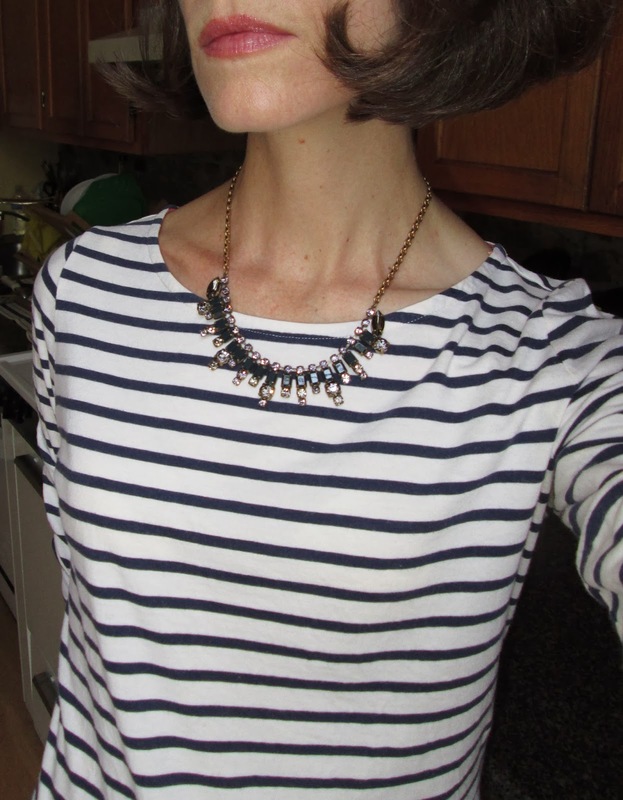 Crew in-store sales, when I could stock up on basics like T-shirts (which were Planned Purchases), but then I’d fall in love with something else, like the crystal baguette necklace above. All in all, it was an interesting exercise and I’m glad I gave it a try. I am also glad it’s over! Who needs the guilt? How did your 2013 goals fare by the end of the year? Wow a shopping ban for a year! That's impressive and in my book you succeed!! Great job! I would seriously struggle with a total shopping ban....you are an inspiration to have even attempted this challenge. You must have edited your wardrobe with a savvy and chic eye. Perhaps you can share what you have hanging in your closet? I am going to enable you here......but as a recent convert to Essie (longtime OPI girl here) I think you should try Bobbing for Baubles.........addictive! Like you, I often think of things I already have that will fill a purchase craving or cute trend. (I found a box of old nail polishes that are still perfectly fluid, including Revlon's Marooned and L'Oreal's wonderful iridescent cordovan Plumage -- that has saved me money over the fall/winter!) I also bookmark or wishlist purchase wants...and then I wait. I often forget an item or realize I'm being silly; or I realize I can just leave the item wishlisted and see if it's on sale when I'm more flush in the handbag. I have tried shopping ban for January and I have made 3 weeks. I have found that it is times when I feel insecure that I reach for the credit card. Your list seems like a good idea. I find shopping bans quite like diets…the more I restrict myself the more I want. Lately trying to stick with only secondhand items is helping although I can't seem to shake the lure of Anthropologie when they have a sale. The only thing that seems to stop me is being sick all the time. Not the best way to avoid shopping. I think you did brilliantly! I mean its really not about BANNING its more about CONTROL; and I think you did just that! We are never going to stop shopping TOTALLY (let's be real), but thinking and planning our purchases disolves the guilt--to a certain degree. I have been putting my purchases on a 30 day list for almost 10 years now. Items dont always get to 30 days, but it gives me some time to think about it. AND I employ the 1 in, 1 out rule in my closet. Aparently, tho, I have missed some items as my closet is very tight right now. I appreciate your lessons, Jill and this is always a great reminder to those of us who love to shop. I have more control now than ever before in my life. And I have learned a lot through it. Shopping bans are very difficult for me. I did one for a mere month the summer before last and I barely made. In part because, like you, I'd go for a Planned Purchase of necessities and see a bunch of other things I loved. I've done a few shopping bans before but only short ones - I think one for 30 days and another for two months. They are not easy! I think - as you said - the best thing about shopping bans is they make you think about your purchases. What a lovely little collection of nail polishes you now have. How fun! Met a few 2013 goals -- but would never do a shopping ban...I have no discipline if it's beautiful and affordable!! What a great post Jill.A year is an incredibly long time for anyone not to spend. Sorry, Jill. I think I hit the send button then before I had finished. I was saying that a year is such a long time for anyone to spend. It sounds as though it was a really useful exercise in making you take the time to really consider the purchases that you did make. And who doesn't love a new nail polish? Jill this is a great post. I'm always feeling like cleaning up, clearing out and using up come January. That includes finishing up things like my skincare, polishes, lipsticks before purchasing more on a whim. I haven't done a specific ban on shopping but I'm carefully looking at what I already have-shopping my closet-as we say. It does help me that I have not a JCrew, Macys, zara within 90 miles from where I live. If I stay of online shopping I do okay. Great ideas here and stay warm my friend. Your experience is very impressive ! Sometimes, I manage to shop less. But I often indulge myself with nail polihes too ! Wow! I love completely your collection. Especially those chanel earrings and watch are super cute. I would like to buy something like this on my upcoming birthday. I am just waiting for my mom to ask me for my birthday.